The Indigenous People of Biafra, IPOB, has condemned, in strong terms, its sudden proscription by Justice Abdullahi Kafarati of the Federal High Court sitting in Abuja, on Thursday. IPOB through its Media and Publicity Secretary, Comrade Emma Powerful, said Kafarati who is now the Acting Chief Judge of the Federal High Court, after his successor, Ibrahim Auta bowed out on Monday, is more concerned in his quest to be appointed the substantive Chief Judge of the court. IPOB also decried the excessive manipulation of the Nigerian judiciary by the APC-led Federal government, even as it challenged the FG to produce evidence of acts of terrorism against it, adding that IPOB is operating in over one hundred countries and territories around the world. The statement read in full, “We Indigenous People of Biafra (IPOB) under the command and leadership of Mazi Nnamdi Kanu condemn the disgracefully shambolic, crudely fabricated and concocted order obtained from the biased APC lackey, the Federal High Court Chief Justice Kafarati in Abuja. 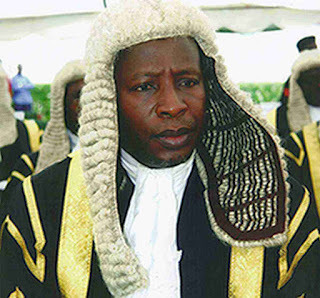 By granting the obnoxious order proscribing and labeling IPOB an unlawful terrorist group, Justice Kafarati has placed his judicial reputation on the line by openly siding with evil. Justice Kafarati is more concerned about this APC Government of Major General Buhari confirming him as the substantive Chief Justice of the Federal High Court than his unbiased dispensation of justice without fear or favour according to his oath of office. We must continue to ask what evidence led Justice Kafarati to bow to blackmail and pressure from DSS and Aso Rock to grant this order when the very brave Justice Binta Nyako ruled in the same High Court sitting in Abuja that IPOB is not an illegal organisation. “Unarmed, peaceful IPOB should never and cannot be labeled a terrorist organisation when Fulani herdsmen from Buhari's tribe, with their Hausa Fulani soldiers in the Nigerian Army are the ones killing IPOB family members. The world can now clearly see there is something fundamentally wrong with the Nigerian psyche and it's propensity to reward evil and punish good. Nigeria will go down in history as the only country on earth to proscribe a peaceful organisation whilst blood thirsty violent marauders are given financial inducements to stop killing their innocent victims. “It's also very appalling and an affront to common sense that the judiciary in Nigeria always allow itself to be manipulated and messed about by whichever government is in power but more so in this dictatorial APC regime as demonstrated through this injudicious order granted by Justice Kafarati proscribing IPOB. It has inadvertently made itself a laughing stock in the judicial world. No wonder more civilised parts of humanity sometimes see we Africans as being incapable of mental development beyond self preserving primitive alliances. Legal practitioners all over the world would be wondering what caliber of people make it to the bench in Nigeria if a judge can order the banning of an association that has no history of violence whatsoever. “Any judge or court of law worth its salt would have in the very least, demanded for proof of evidence of terrorists acts by IPOB, before doing the bidding of the government. In this case, as with most cases against IPOB, the only evidence provided by the very lying Lai Mohammed and the Attorney General of the Federation, is a video clip of brave IPOB men standing defiantly in front of an armored tank that killed 3 of their own in an unprovoked attack by the Nigerian Army at the home of their leader Mazi Nnamdi Kanu in Isiama Afaraukwu Ibeku. “Thanks to the monumental incompetence of the Buhari led genocidal administration, the story of this backward, murderous, despotic and genocidal British contraption called Nigeria has gone viral. This incomprehensible and wholly unethical judicial pronouncement by the very corrupt Justice Kafarati is the icing on the cake that goes to reinforce our belief that Nigeria is not a civilised country and can never be. If judges can reason the way a supposedly 'learned' Justice Kafarati did, how much more ordinary citizens. Years of enduring blackmail, threats and humiliation of judges by this Buhari's regime is beginning to pay off. We dread to think of what might have become of the few brave judges like Justice Binta Nyako who stood their ground to deliver sensible judgement even under the threat of imprisonment and demotion. We IPOB through our nonviolent passive resistance have reduced Nigeria to its true crude predatory state of nature. The purveyors of iniquity under the guise of preserving a sovereignty that was artificially put together by one white man named Luggard, have been exposed for the blood thirsty savages they are. “Nigerians should wonder how the civilised world view them and their government officials today, including the judiciary, which have proven themselves to be the most corrupt and morally bankrupt nation on earth. Declaring IPOB a terrorist organisation is more or less declaring the whole indigenous peoples who lived and still living in their ancestral homeland in Biafraland, before and after the white man came, as terrorists. IPOB have never bombed or killed anyone. Our rallies are the most peaceful with no recorded incident or fracas or lawlessness; we have not killed anyone, yet Hausa Fulani Islamic dominated Nigeria, along with their judiciary and sponsored media attack dogs tagged us a terrorist group. We are not terrorists and can never be because our struggle for Biafra self determination is our undeniable right under United Nations and African Charter which Nigeria is a signatory to. “A Federal High Court presided over by Justice Binta Nyako on 6th March 2017 declared IPOB under the leadership of Mazi Nnamdi Kanu a lawful organisation. The judge went further to say that the fact IPOB is not registered in Nigeria does not make it illegal. Since nothing has changed from the date of that judicial pronouncement till today, on what facts of law did Justice Kafarati base his ruling that IPOB should be proscribed. IPOB is recognised and operating lawfully in over 100 countries and territories around the world. Our conduct in each of these countries has remained impeccable and exemplary. IPOB have not indulged in any criminal activity since its inception or killed anybody irrespective of the attacks, killings and humiliation our members receive regularly from the Nigerian government and her security operatives. We urge Biafrans to be resolute because we are almost at the gate of freedom which Nigeria government with it's armored vehicle and tanks cannot stop. “This APC government is in turmoil, running from pillar to post in an effort to limit the damage they have inflicted on themselves, hence the lies and paid media attacks against IPOB from faceless groups and nonexistent individuals. They have seen the hand writing on the wall and can testify that crushing IPOB is not possible in this life. Despite billions of dollars of crude oil money from Biafraland, total control of the instruments of coercion, media and propaganda machinery at their disposal, IPOB remains stronger than ever before. Nigerian Government are the ones looking for an escape route out the mess they plunged themselves into. COMRADE EMMA POWERFUL, MEDIA AND PUBLICITY SEC.